Use the satin color side outwards. Use for posterior quadrant dentistry. Use the same cotton tipped applicator that was used to apply the topical anesthetic to lubricate the dental dam during placement. Once in place, the gel can be easily washed off with water spray. You only need to punch the dam once. 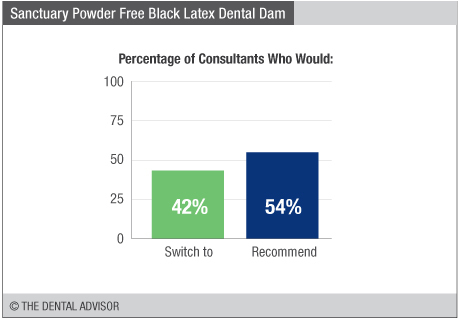 Sanctuary Powder Free Black Latex Dental Dam was evaluated by 24 consultants for a total of 267 times. A variety of thicknesses and 2 sizes. Oral procedures requiring use of a rubber dam. Only suitable for patients with no known allergy to latex. 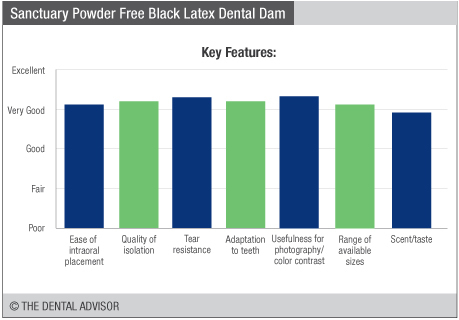 The black color of the dental dam provides for good contrast in dental photography. 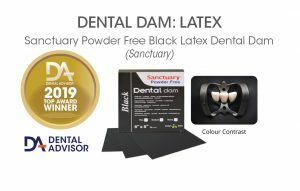 Sanctuary Powder Free Black Latex Dental Dam is powder-free, mint-scented and offers high tear resistance. It is fabricated using a proprietary cleaning technique that removes most of the proteins attributed to latex allergies. 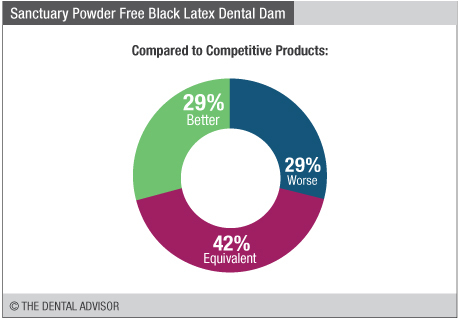 The dental dam is opaque and black. Sanctuary Powder Free Black Latex Dental Dam is available in Medium gauge. The dam is packaged in pre-cut 6”x6” sheets (36/box).